The HDM-SPL-2422DS 1x8 HDMI 2.0a Splitter with Built-in & User Adjustable EDID Management provides the most cost effective and advanced HDMI splitter solution on the market, by which the high definition video and high quality audio can be transmitted to 2 different locations without losing quality. HDM-SPL-2422DS supports HDR and the true 4K2K video! 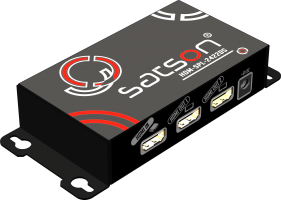 With built-in USB firmware update mechanism, the compatibility among countless HDMI sources and receivers can be further guaranteed. With the upmost HDR/4K2K@60 4:4:4 8bits and high definition audio support, HDM-SPL-2422DS is suitable for high quality HDMI broadcasting, digital signage and education applications!